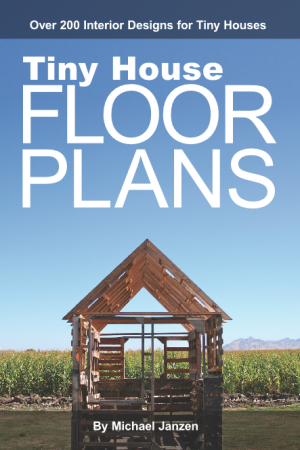 So, I just got my hands on Michael Janzen's brand new book "Tiny House Floor Plans", and as he promised, its loaded with layout ideas- TWO HUNDRED AND THIRTY OF THEM to be precise. If you're in the daydreaming and planning phases of your potential, future, tiny house or cabin, Janzen's schematics show just how it is possible to fit so much into so little. Pocket doors, sliders and french doors (doubling as windows AND entrance ways), foldable murphy-style beds, sliding library ladders, and micro lofts make squeezing most any aspect of a traditionally sized home, into a tiny one, possible. Basically, for those in the planning phases, who want a very large collection of visual options and housing/furniture arrangements to toy with, this book is certainly up your alley, and bound to arm you with many viable ideas- there are certainly some very clever layouts in here. You can check out "Tiny House Floor Plans" through the link below....as well as my book "Humble Homes, Simple Shacks". 2012 seems to be quite the year for the small housing scene- especially in terms of book releases (in a VERY good way! ).